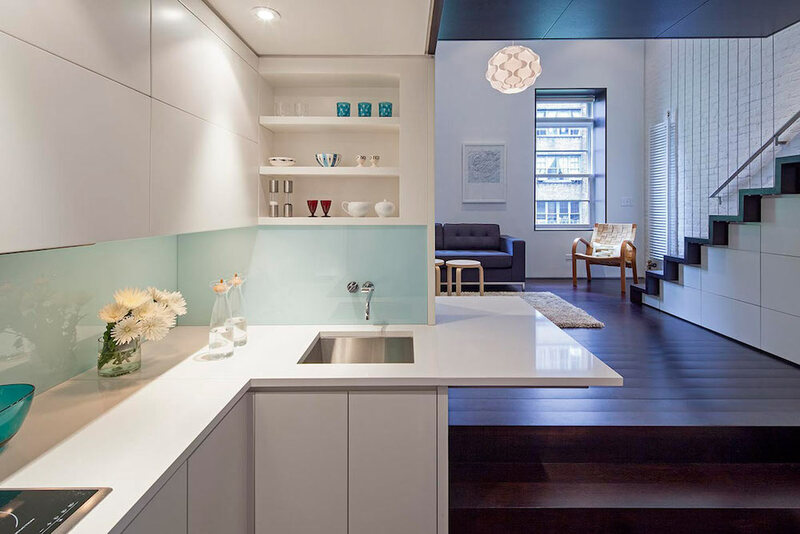 This ‘micro-loft’ apartment in Manhattan was created by Specht Harpman Architects on the top floor of a brownstone with an awkward floorplan and serious space limitations. The apartment has a footprint of just 425 square foot (which equates to just under 40m² for those outside of the United States) but it certainly doesn’t feel like it. 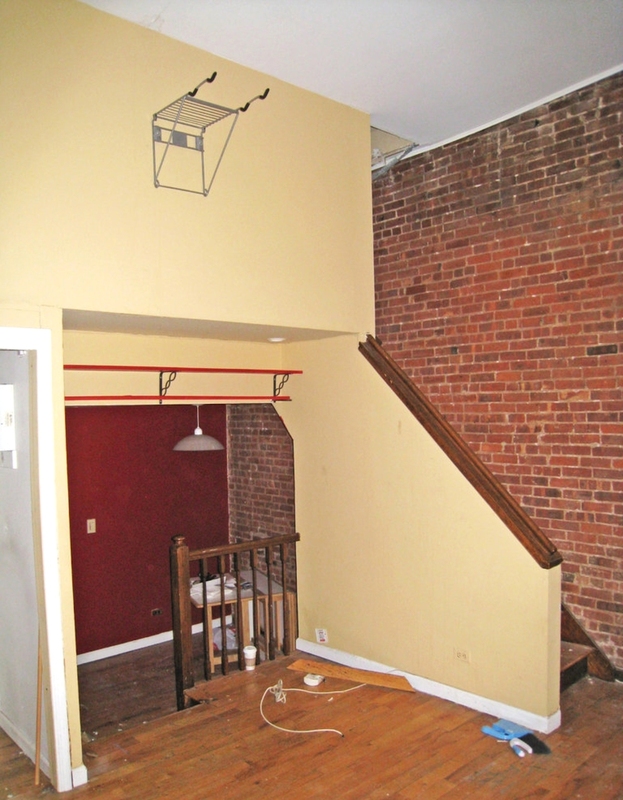 Sure, this is by no means the smallest apartment of all time but what is remarkable about it is how comfortable it looks to live in. 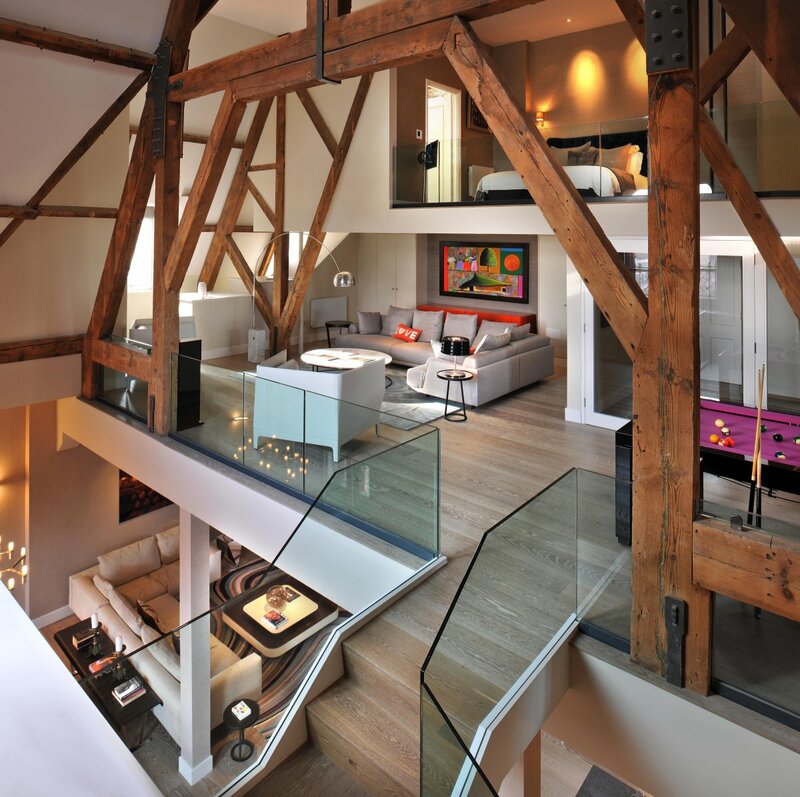 This is because the extraordinary ceiling height of 24 feet allowed Specht Harpman to create a multilevelled micro-loft with distinct areas divided without the need of walls. 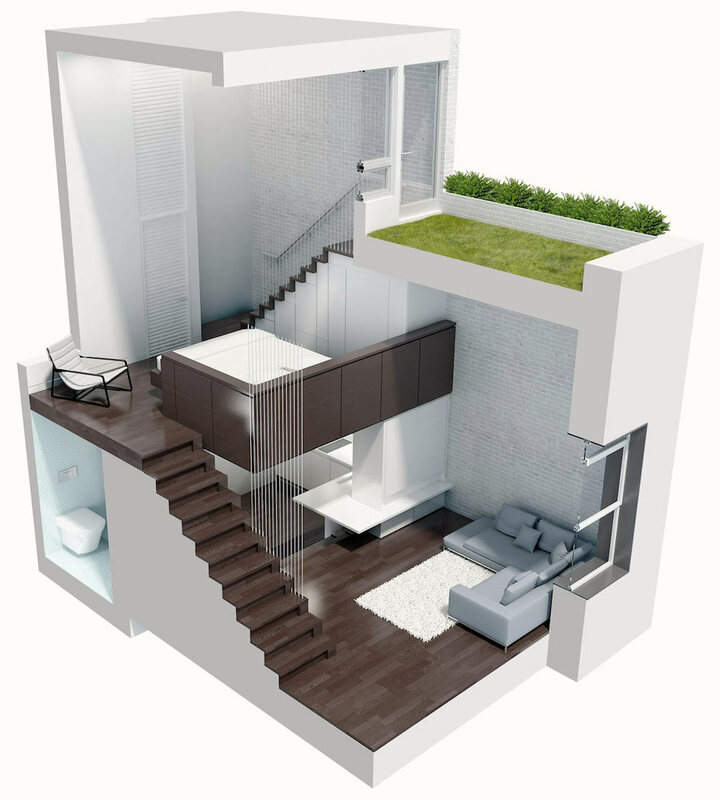 In fact the only internal door in the Manhattan micro-loft is for the bathroom; the bedroom exists as a mezzanine level and the kitchen and living area are divided by a split level floor. 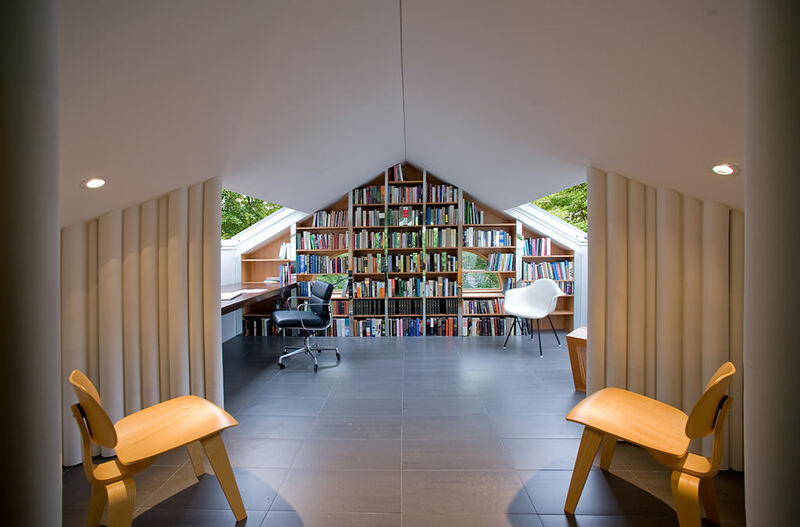 Despite the extreme limitations on space in this loft apartment renovation, there are no compromises made as to what you’d want from a living space; they’ve still managed to fit everything into it in some way or another, even a garden! 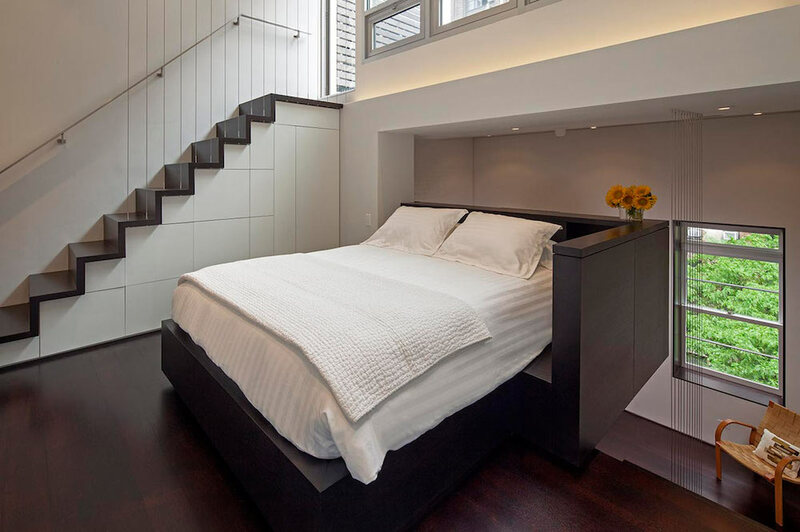 The living area is compact but still provides ample space in which to unwind and the mezzanine bedroom houses a full sized bed which wasn’t even possible in the apartment prior to its renovation. 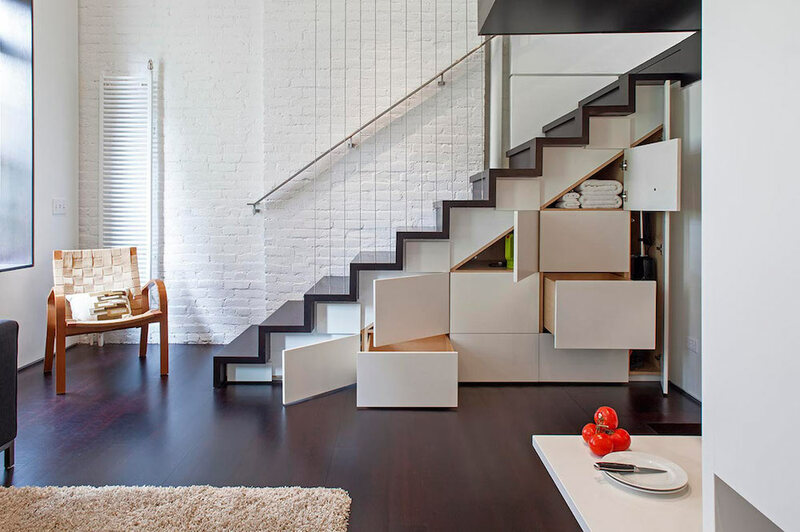 A renovation like the manhattan micro-loft is all about making the most of every little bit of space available. 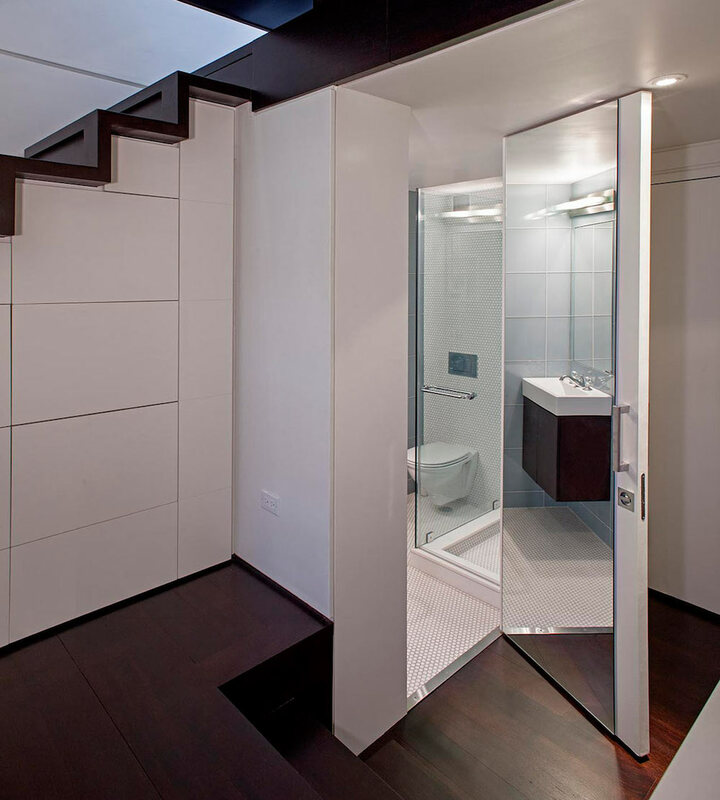 For example the door to the bathroom goes from floor to ceiling (to avoid wasting space on a doorframe) and features a mirrored surface on the inside to make the room feel larger. 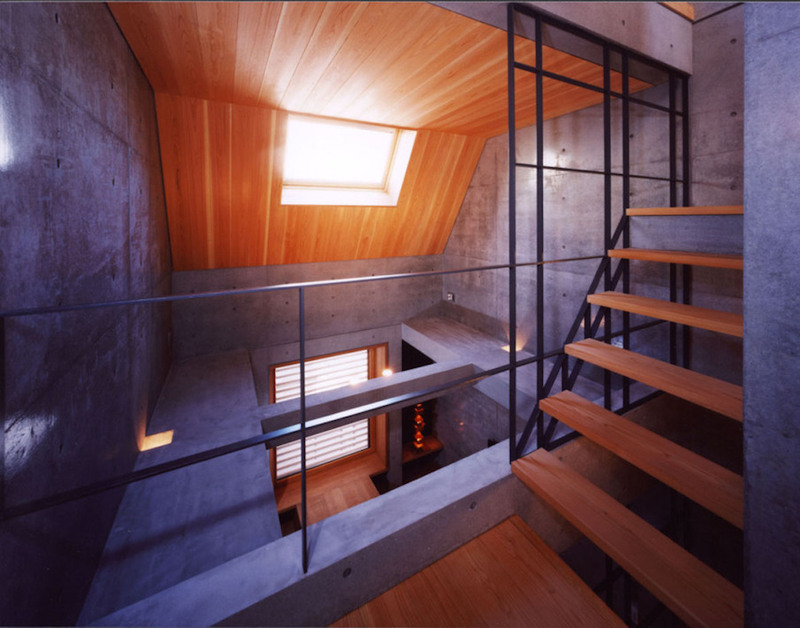 Most of the bathroom is also neatly tucked away under the stair case making use of what is often wasted space in a floorplan. 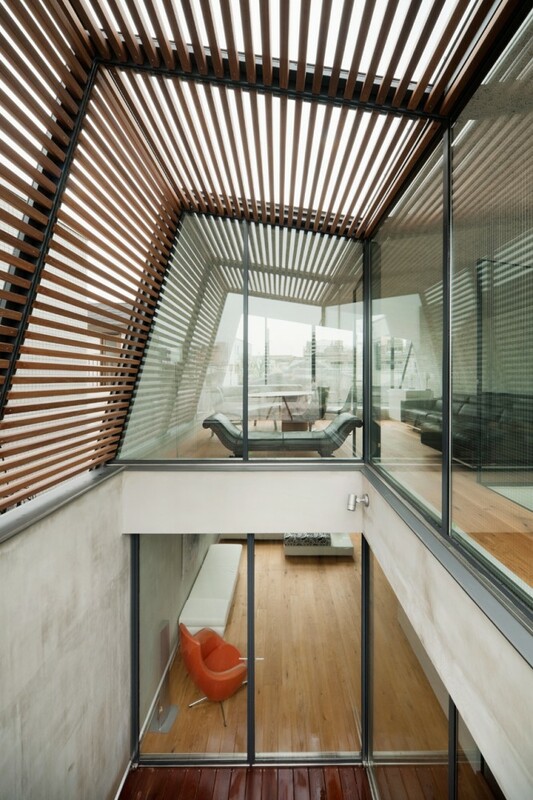 The utilisation of the staircase doesn’t stop there though as both staircases, one leading to the mezzanine bedroom and the one leading to the roof terrace garden, both feature ingenious arrangements of cabinets, shelves and drawers which provide a tremendous level of storage space. This combats the lack of space for traditional wardrobes in the bedroom and allows the rest of the apartment to remain uncluttered. 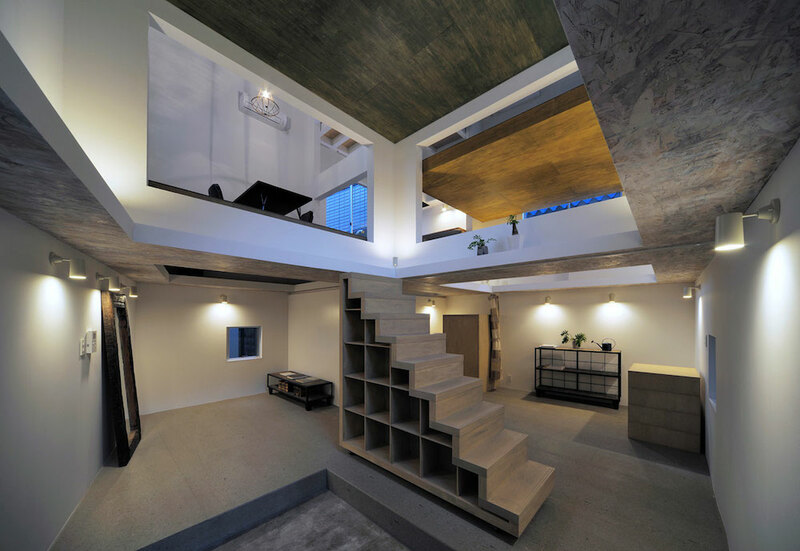 This attention to detail and the effort to get the most out of every bit of space is very noticeable, such as how the kitchen counter is cantilevered to give maximum workspace, yet to still allow a through-view under it from the kitchen to the living area. 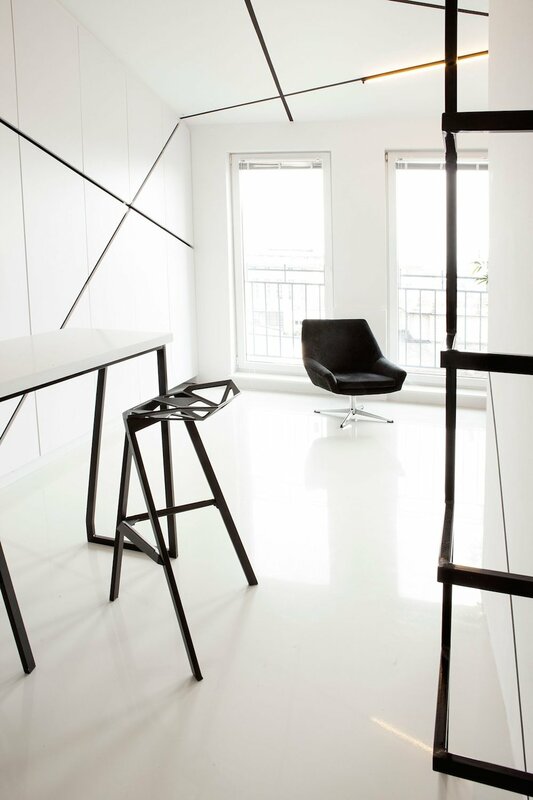 It’s all these little considerations made by Specht Harpman that culminate to create this perfectly proportioned apartment which has such a great sense of composition that it doesn’t look like it was designed to fit into an awkward space at all. Instead, that it was intended to be this way all along. The apartment prior to renovation is barely recognisable.